South Dakotans may be independent, but they’re also generous and caring. Farmers and city dwellers alike give back to their communities in a variety of ways, despite their busy schedules. Many communities depend on volunteer firefighters to respond in an emergency. In fact, seven out of 10 firefighters in the U.S. are volunteers! * Farmers and non-farmers serve as volunteer firefighters, which can require training and background checks. Risking life and limb fighting fires—and showing up as first responders in emergencies—is truly heroic. 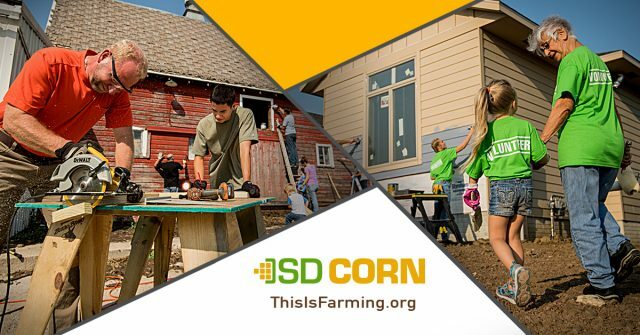 Farmers, like city dwellers, help one another during a family or personal crisis. If you live in the city you might bring meals, help with lawn chores or provide rides. Farmers will plant, harvest, tend livestock and more for a neighboring farmer experiencing tough times. It’s also common for farmers to donate supplies to fellow farmers, such as hay during a drought. Non-farmers have opportunities to donate food or dollars for food to local food banks. Similarly, farmers who produce food are in a position to donate that food to families in need, on a personal basis or through organizations. For example, they might donate a side of beef to a struggling neighbor or donate unsold produce to local food banks. City-dwellers will share land for community gardens or children’s activities. Farmers sometimes allow individuals and organizations to use their land for activities such as hayrides, bonfires, horseback rides and more. Farmers also share their land with hunters, fishermen and snowmobilers. Similar to their counterparts in cities, farmers often volunteer to work with children. Through 4-H and FFA, they teach kids about many facets of agriculture and help them learn specific skills for animal showing, career development and more. Again, like city dwellers, farmers also serve as coaches for children’s teams, including livestock judging, baseball, softball, football and rodeo. Farmers serve as community leaders on boards and commissions, just like folks who live in towns and cities statewide. Whether elected or appointed, folks who serve in these capacities donate a tremendous amount of their time to help keep infrastructure strong. While non-farmers might share snow blowers with neighbors, farmers are able to share equipment like tractors or trucks. For example, farmers help break ground for gardens, remove snow, move pallets, haul items to the dump and more. From joining booster clubs to hosting field trips and teaching Sunday school, community activities provide farmers and city dwellers an opportunity to give back, make connections and support young people. Volunteering also provides South Dakotans an opportunity to meet new people and experience the feelings of purpose and joy that come with giving.